With grown children and a wife who was often out of the house on speaking tours, President Franklin Roosevelt needed a companion. Enter Fala (full name: Murray the Outlaw of Fala Hill). 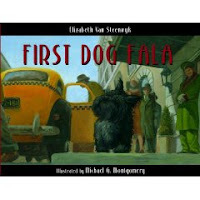 A rambunctious pup who craved attention and sometimes took himself for walks around the city, Fala quickly became FDR's best friend. With endearing illustrations and an adorable story, this sweet picture book will find a place with dog lovers (and take a look at that cover... who could NOT love this dog?!). Andy loves his Auntie Elsie. Sure he does. But WHY OH WHY does she always have to smother him with sloppy kisses whenever she sees him?? Andy has no choice but to try and avoid her. He tries hiding under his bed... in the hen house... up a tree... to no avail. But when Auntie Elsie suddenly stops showing up, Andy just might find that he misses her kiss kiss. This funny picture book comes to us from New Zealand and I imagine it will appeal to fans of the Charlie and Lola books with its mixed media illustrations. Kids will definitely want to pore over these pictures and find all the details. All the children love to hear Babba Zarrah tell stories. They spread out on her story blanket to listen. When Babba Zarrah notices one of the boys needs new socks, she sets out to make him some... but where is she to get the wool? 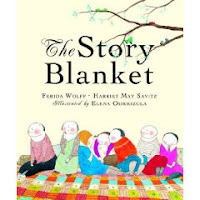 As mysterious gifts show up all over the village, the story blanket gets smaller and smaller until at last the villagers figure out what's going on and come together to help Babba Zarrah make a new story blanket. I'm often asked for books tying into units on building character and this is a great one about sharing. Bright pictures and interesting patterns make the illustrations pop. I love the funny faces and rosy cheeks of all the characters. I received these gems from the lovely people at Peachtree Press and from the looks of it, they are all available now. Do check out Peachtree's site and peruse the other titles they have!